1. Preheat oven to 325deg F (160 deg C). 2. Lined a 9"x9" baking pan with parchment paper. 3. For the sponge base, mix all ingredients except the melted butter. Beat on high speed until fluffy. Add melted butter and beat again until completely mixed. 4. Bake for 50 mins to 1 hour on middle rack. Test with skewer for doneness. Cooled on wire rack. Once cake is completely cooled, cut cake horizontally into half. 5. Mix cream cheese, condensed milk and whipping cream and beat till thick. Spread some cream cheese mixture on top of the bottom layer of the cut cake. Place the upper layer on top of it and spread the remaining mixture on the top and sides of the cake. 6. 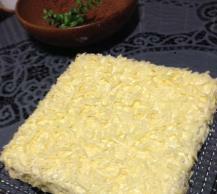 Remove grated cheddar cheese from the fridge and sprinkle evenly on the top and sides of the cake. Chilled cake for at least 2 hours before serving.